Udupi, May 22, 2015 : Addressing media on May 21, Thursday, Vidyavallabha Tirtha Swami of Paryaya Kaniyur Mutt, said that The All India Sri Vijayadasara Kshetra Aradhana Samiti is organising the Aradhana festival of Sri Vijayadasa and bi-centenary Aradhana festival of Sri Mohanadasa at Rajangana here from May 23 to 25. Sri Vijayadasa and Sri Mohandasa had visited Udupi many times and composed several devotional songs on Lord Krishna. Hence, programmes would held to mark both these Aradhana Mahotsavas. Vishwapriya Tirtha Swami of Admar Mutt would inaugurate the Aradhana Mahotsava at 8 a.m. on May 23. Mukundacharya Hayagreeva, scholar, would deliver a lecture on ‘Haridasaru Kanda Sri Krishna’ at 9 a.m. In the afternoon session, Madhweshacharya Mathada, scholar, would speak on ‘Sri Krishna Mahime’ at 3.30 p.m. 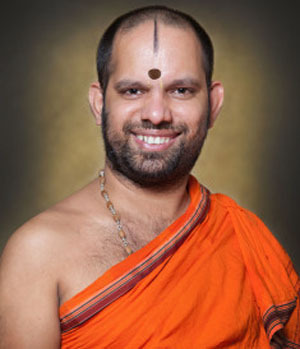 This would be followed by ‘Dasavani’ programme by Jayatirtha Mevundi at 4.30 p.m.
On May 24, Dhulkhed Narayanacharya, scholar, would deliver a lecture on ‘Mohanadasaru Kandante Udupi Sri Krishna’ at 9 a.m. Post-lunch session, Hrishikeshacharya, scholar, would speak on ‘Bhagavatada Dashama Skandadalli Sri Krishnana Varnane’ at 3.30 p.m. This would be followed by a devotional music programme ‘Dasavani’ at 4.30 p.m.
May 25, the concluding day would begin with a public function. Anandatirhtacharya Pagadal, Special Officer, Dasa Sahitya Project, Tirupati Tirumala Temple, would preside over the function at 8 a.m. This would be followed by a lecture by D. Gopalacharya, Director of Sri Vadiraja Research Centre, Udupi, at 9 a.m. In the afternoon session, Anandatirthacharya Mahishi, will speak on ‘Vijayadasaru Kanda Sri Krishna’ at 3.30 p.m. A good participation is expected by the organisers.